This photograph depicts the first time either of us flew in a helicopter. Kirsty and I spent all of December 1998 in Nepal and during this time we trekked for 10 days from Pokhara to the holy village of Muktinath (commonly known as the Jomson trek). 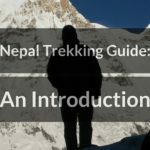 Early December is a great time to trek in Nepal – the air is clear and the mountain views are normally superb throughout the entire day. 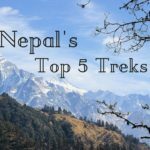 Furthermore, the trails are relatively free of trekkers as it is just before the Christmas season rush when the paths get busier. 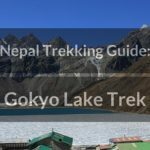 We had had a good trek and were on our way back from Kagbeni to Jomson, where we intended to spend the night before catching our flight back to Pokhara the next morning. We were making good ground when suddenly Kirsty shouted out with pain and collapsed onto the ground. An old skiing injury compounded by a subsequent aerobics class accident meant that her right knee was weak and although she was wearing a surgical knee-support, her knee finally gave up the ghost on the final day of the trek. Luckily, we were only an hour out of Jomson but the pain was too much for Kirsty to continue. So me, being the hero that I am (! ), took her pack and carried both hers and mine at pace to Jomson. Dropping them off, I then returned to rendezvous with Kirsty (she had made a little progress) and helped her hobble back to Jomson. Upon arrival, I found a place for Kirsty to rest and then went off to reconfirm our flight to Pokhara for the next day. Arriving at the airline shed, I was told that no flights had landed in Jomson for the past few days. The system with the flights back then was simple: those who had been waiting the longest got on the next available flight. This meant we were looking at a wait of at least three days, if we were lucky, before catching a flight to Pokhara. Kirsty was in quite a lot of pain and we were pondering our limited options (*) when suddenly a helicopter came into view and landed on the airstrip. I went and had a chat with the pilot. 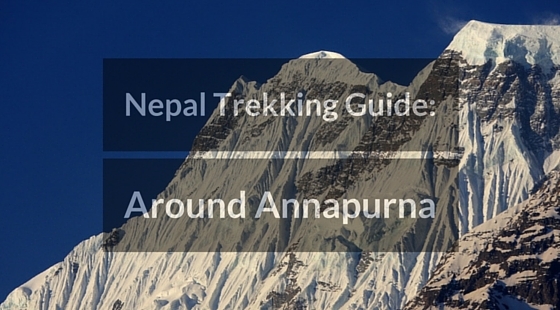 He had just dropped off two trekkers and their mountain bikes and was planning to head back empty. I seized on this opportunity, explained what had happened and asked if we could hitch a ride back to Pokhara. Hitch, no way (the ruthless git! ), but if we were prepared to pay then we could open a dialogue. So open a dialogue I did and we settled on US$400 for the two of us. It would have cost us more but there were two more trekkers in exactly the same situation, albeit one of them had a twisted ankle as opposed to a busted knee. They also paid US$400 for the journey. There was space for one more person inside the helicopter and it went to the lady in the left of the photo clutching the plastic bag. The reason she is smiling is because she paid for her fare with two bags of apples! (*) These days the flights are more reliable plus there is the option to drive via a rough road from Jomson to Pokhara in about 6 hours. We set off into the headwind and flew in a southerly direction straight through the Kali Gandaki Gorge. My prose is not good enough to accurately describe the thrill and excitement that I felt throughout the journey. At one point the winds were so strong that they appeared to stop the helicopter in mid-air but we landed safely about 30 minutes later and within 2 hours of leaving Jomson, we were sitting in the Moondance restaurant, gorging on cajun chicken wings, drinking cold beer and reliving the brilliant, albeit expensive, helicopter ride we had just experienced.